We have made you a step-by-step description of the buying process to make this process as easy and convenient as possible. Please see also the international costs of delivery. 3. Fill out the ordering form and mark the preferred logos (you do not have to choose a logo, if you leave it empty, there just will not be anything). You can upload logos that you wish to add or are simply less common through your Crostic account. 5. When design is ready we will send it to your e-mail for you to see if everything is the way you wanted and get your approval. If all is ok, we will start manufacturing your products. 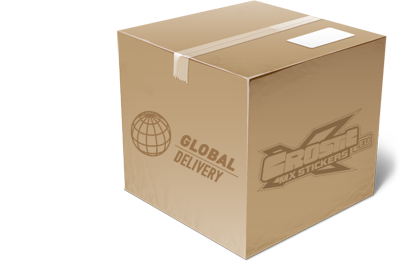 When products are ready, you will receive them on your shipping address. 1. Visit our full-custom products page in our online store. 2. Fill out the ordering form by writing a detailed description of your needs and wishes. 3. Our designer will contact you, if he has any questions. But if all is clear, you will not be contacted until design samples are ready and sent to your e-mail. 4. If we have completed the design you will receive an invoice and after making a payment, we will start manufacturing your order. List of countries and delivery costs.